Happy Autumnal Equinox! And to my friends in the southern hemisphere, happy spring! Fall has definitely arrived. The nights are cool and the early morning downright chilly. I had to wear a light jacket to the bus stop most mornings this week and the cold floor beneath the window left open all night definitely startles me awake as I stumble by at 5 a.m. to shower and start my day. The squirrels are busy squirreling away food for winter. The crickets still chirp but are frequently drowned out by the honking of low flying geese on their way south. And the leaves on some trees are beginning to show some color. And instead of heat waves, the weather forecasters are now speculating when we might have our first frost. For my area the average date is the first week of October but really, it can happen any time now. we didn’t plant any unless it was an odd ball in the six-pack mix of bell peppers we bought at the plant sale in May. I am surprised we got any peppers at all since the plants didn’t actually bloom until the middle of July, very late. We also got a ripe tomato. Not a good year for tomatoes. Two more zucchini. And, surprise! A cantaloupe the size of a softball. It was small but sweet and tasty. Last year we had so many I got sick of them and this year I resigned myself to not having any at all because they got such a late start. So one is a gift. The cool weather has revived the pumpkins and they are once again blooming like crazy. At last count there are nine pie pumpkins out there waiting for that frost to sweeten them up before we pick them and bring them indoors to eat. Garden activities have switched to clean up and getting ready to put everything to bed. I like how we talk about putting a garden to bed. When the garden goes to sleep Bookman and I get to rest for a bit too. But it isn’t bed time just yet. 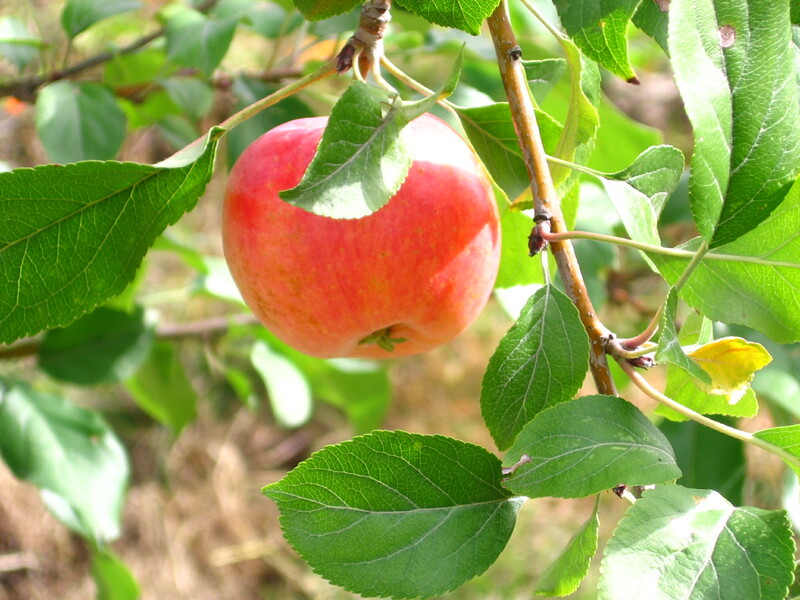 There are apples to pick still. I picked a few yesterday but most of them aren’t quite ready. This week they will be though. Probably. They are ready in their own time and pay no attention to me and how badly I want apple crisp. Stupid apples. I collected more mustard seed this week but haven’t yet separated it from its dry pods. I have to make a point to do that this week so Friday night when we go grocery shopping we can get supplemental seed if we need to. Don’t know if I will have made mustard in time to tell you about it next week, but if not it will definitely be soon! 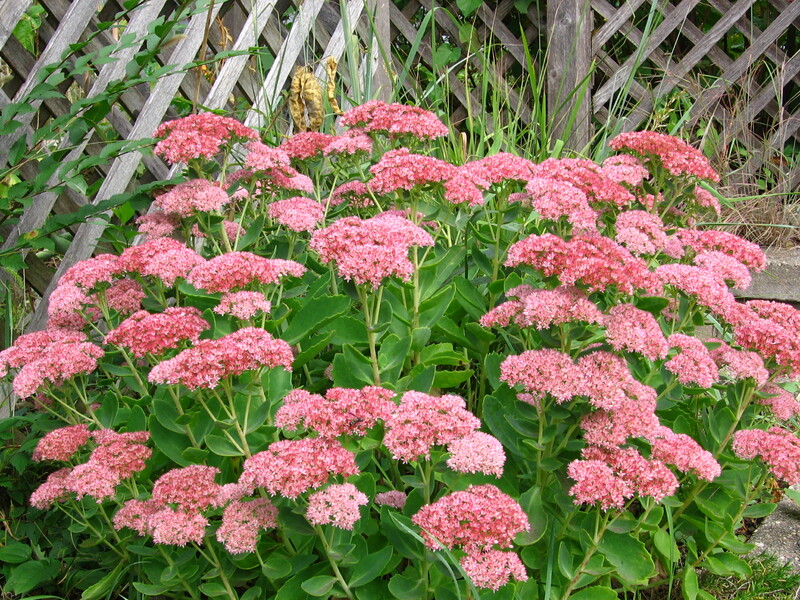 The sedum “autumn joy” is finally colored up and looking big and beautiful. It is covered in pollinators of all kinds. 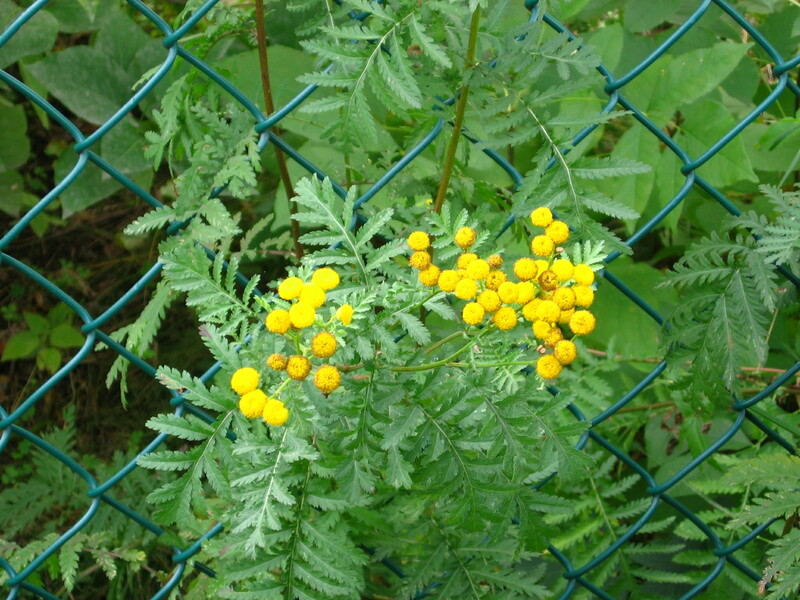 The tansy is also blooming. We never planted it but it migrated from my neighbor’s garden long ago. It has pretty ferny foliage and bright yellow button flowers and pollinators like it. We made the mistake of letting it alone not knowing how invasive it can be. A few years ago we hacked it all back and ripped out bunches of it ruthlessly. It has begun popping up in a few places again. It’s fine but this time we will be sure to keep it more under control. and did nothing for so long I thought it might not make it or would just be a stunted thing. But it has been secretly climbing and now has delicate white flowers on it. It is really lovely and I am happy it decided to grow. 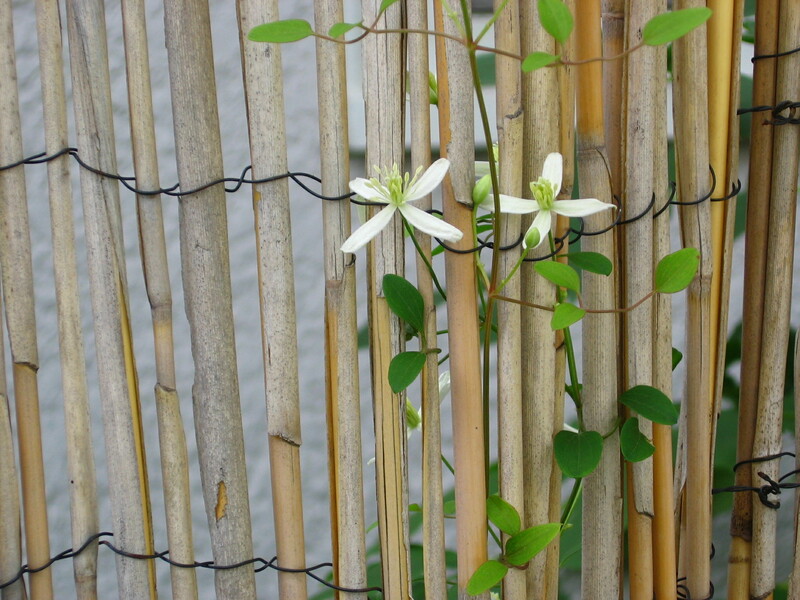 I hope in a few years it will have expanded and made itself at home climbing on my bamboo fencing. A fairly quiet gardening week. A calm before a final flurry of activity. We’ve gone back to summer this week, just as I’d packed all my light weight clothes away for the year. Do I get them out again? Or do I brazen it out, knowing that whatever decision I take the weather will immediately react accordingly and make sure it was the wrong one. By the way, I’ve decided to sign up for the Coursera Historical fiction course. How many others do you know of? Alex, heh, isn’t that the way it goes? I was thinking of packing away my summer clothes over the weekend but I’m glad I didn’t because it’s supposed to be warm for a few days by the end of the week. There is always that dilemma and when I get it wrong I usually just brazen it out. Hooray! So glad you signed up for the historical fiction course. I think you put the group at five. I will try to send an email out to everyone this week so we can figure out how we might want to facilitate our own discussion group. One variety in my daily walks takes me past a garden with a big bush of sedum like you have in bloom. I will think of you when passing it from now on. Today is the first day of a badly needed two-week vacation for me, so visiting your blogpage and reading about your gardening adventures is the perfect start to my schedule of deliberate laziness. I hope you don’t mind, but I wrote a poem about it all. checked on things we had planted from a sale in May. but this was offset by zucchinis untold. and there’s no apple crisp ‘cuz our apples are stupid. we would bend down to find a stray jalapeno. Where did it come from? The mystery remains. As we wait for the frost, and the summer, it wanes. Oh Cip! Bookman and I both thank you for the wonderful poem. You gave us a good laugh. What a gift! I hope you enjoy your vacation. I could use one of those too. It’s so nice to count the seasons with our gardens to help, isn’t it? I’m glad for Fall, although we don’t seem to get much of one in California, but it is nice for it to get a bit cooler and for a bit of rain to come too. boarding, most definitely! It slows time down and keeps me grounded I find. Even if you don;t have a dramatic change in season I seem to recall you are in the north so you get more than I got growing up in the south! Enjoy the cooler weather and I hope your rain is abundant but gentle. How wonderful to have those fruits and veggies from your garden! We have finally gotten some cool temps in the mornings and I’m thrilled. Did you get lots of good veggies from your garden this year, then? And this is a stupid question, but you can’t eat crab apples can you? They are crabby because they are sour, or am I just making that all up? How funny about the jalapeno–he must be the black sheel of the family…. Danielle, yeah, the veggie garden did pretty well in spite of the slow start. Not a banner year, but not bad either. You can eat crab apples they just have to be cooked into something like apple butter or jelly.